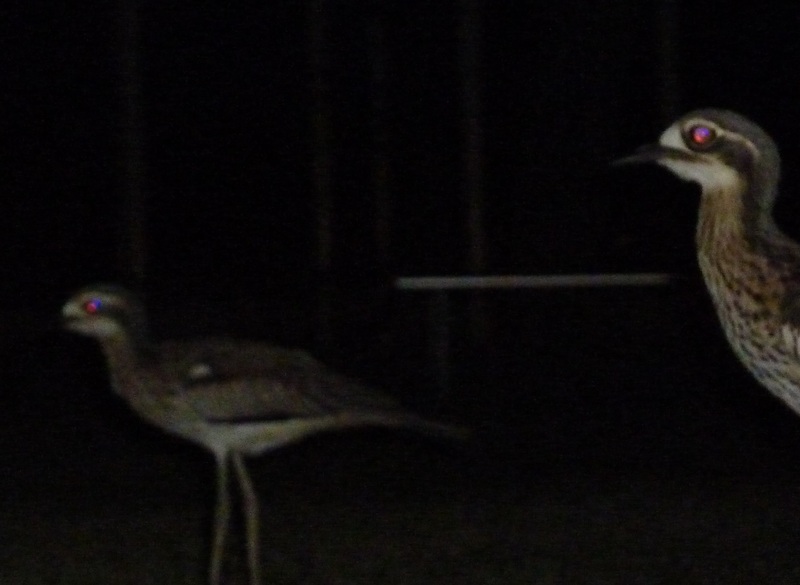 I had some luck on Monday night trying to get some photos of the bush stone curlews (no idea what I’m talking about? read my last post). While T-J and Xander played in the park I crawled around on the grass trying to get close enough for a good shot without scaring the birds. Some of them even stopped, looking at me curiously as I lay stomach down on the dirt with my camera watching them. Still not the best shots, but for an amateur with an old camera the results aren’t too shabby. With his reaction I expected a big fella, maybe not as huge as some we’ve had in our old house (which backed directly onto a creek and bushland)(we once had a carpet python on the back stairs so large we actually called a professional because we were genuinely afraid for our dogs (beagles)) but certainly not a little juvenile snake barely the length of my forearm. The poor little guy disappeared under the fridge before I could get a good look at him, so we had to take precautions for catching him because I couldn’t say (at that point) that he wasn’t a venomous species. SIDE NOTE: you may think a juvenile venomous snake is less venomous than an adult. Not true. They can inject less venom because they are smaller, but if it’s a venomous enough snake you’re still going to need a hospital. So my very stylish and totally professional precaution was to put two large bedsocks on my arm (the thickness of which should ensure the fangs wouldn’t reach my skin). With a stunning teal forearm we got him out from under the fridge and he tried to hide in the pantry. The bedsocks worked perfectly as when the poor little guy (frightened out of his mind) tried to bite me the only reason I knew I’d been bitten was because I could see it happening. Once captured I gave him a quick look over to make sure he wasn’t immediately identifiable as a venomous snake. He didn’t have the black head typical of a juvenile brown snake or the distinct belly of a red belly black snake. I’m not a professional herpetologist, but I grew up on a farm so do know some of the identifiers. He looked like a little tree snake, so we took him to the nearby bushland and released him by an old log.